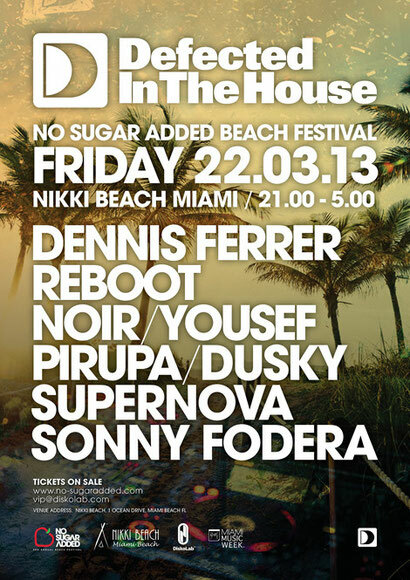 Defected In The House will be hosting an event at the Miami Music Week for the first time since 2010, hosting their own stage at No Sugar Added Beach Festival at Nikki Beach Miami. The annual No Sugar Added Beach Festival takes place on March 22 and 23. Now in its third consecutive year at Miami Music Week, the two-day festival will showcase over 40 artists spanning six different stages, all hosted by well-known music brands. 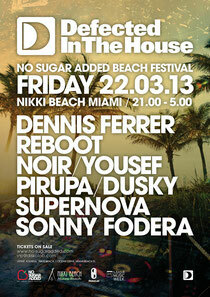 On Friday March 22, Defected In The House will host their own stage at No Sugar added festival, bringing with them a plethora of house talent. Dennis Ferrer, Reboot, Noir, Yousef, Pirupa, Dusky, Supernova and Sonny Fodera are already confirmed to play, with further acts to be announced. Dennis Ferrer and Noir recently played at Defected’s sell-out NYE show at Electric Brixton, while Reboot, Pirupa and Supernova are similarly DJs with whom the label has been working with for some time. In addition, and with releases and remixes due out from all three sets of producers, Dusky, Yousef and Sonny Fodera are all confirmed to play too, although all are still relative newcomers to the Defected ranks. In addition to the event, Defected are also releasing ‘Defected In The House Miami 2013’; a three-CD compilation mixed by Flashmob, Supernova and Pirupa, the 50th release in their celebrated In The House series. It’s out this Monday.